What’s known to some in Korea, but very few outside, is that there is a rich stream of creative talent that bubbles below the surface of mainstream music. Several of such musicians will be making a pilgrimage to the U.S. to play at the upcoming South by Southwest (SXSW) Festival in Austin, Texas, one of the few events in the world that properly celebrates the indie underside of the global music community. Fourteen Korean acts will perform, offering a taste of the Korean indie music from sea-punk hip-hop to ’80s glam metal, alongside the expected dose of K-pop at the festival to run from March 13-22. Experimental duo EE and the nostalgic heavy metal band Victim Mentality are among the groups that will be flying the banner for Korea. “The history of indie music in Korea is still relatively short, so Korean indie bands are not yet renowned with audiences around the world,” says Sohn Kyung-ho, the guitarist for Victim Mentality. The band winds the clock back to the ’80s, dressing head to toe in glam-rock-inspired animal print and makeup. Sohn predicts that those who will see Victim Mentality for the first time will laugh. “I think they’ll probably find us hilarious at first because of our unique appearance. But soon after, I think audiences will be won over by our music and energetic performances,” he said. South by Southwest will be Sohn’s first performance outside of Asia and the band’s first outside of Korea. “It’s a fantastic chance for us to show what we can do, not only somewhere outside of Korea, but also in a place that has a long history in rock and metal music,” he said. The husband and wife duo of EE will be performing in America for the second time in five years. Though they formed EE in 2008, both Lee Hyun-joon and Lee Yun-joung have been involved in the music and creative arts scene in Korea since the mid-1990s, blending installation art and electronic music. They have only recently started taking their art overseas. EE remain the only Korean act to have played at the prestigious Coachella Festival and described the reactions of the international audiences as invaluable motivation for an artist. “Their eyes became wide and their mouths (agape). These faces made us feel blessed and we want to see them again. We’re always happiest when we can encounter an open-minded audience who are excited to experience something different, and that’s what South by Southwest provides,” Lee Yun-joung, the wife, said. Hitchhiker: Renowned DJ and composer Choi Jin-woo is known for writing some of Korea’s biggest hits, but has also been gracing eyes and ears across Korea with his own experimental brand of electronic hip-hop. Epik High: One of the most famous Korean groups on the bill, Epik High brings something new to its hip-hop brand with every album. Crayon Pop: Another of the headline acts, Crayon Pop is famous as being the “quirky girls” of K-pop. This has not stopped them from building an enormous international following. The Barberettes: Giving a glimpse into what K-pop might have been like in the 1950s with their styling and song choice, the Barberettes are one of the most unique girl groups in the world. Asian Chairshot: Psychedelic and long-drawn riffs and hard rock beats describe but don’t define Asian Chairshot. The three childhood friends have been rocking Hongdae for years. Eastern Sidekick: Described as “oriental garage rock,” Eastern Sidekick is another frequent name on the bill at Hongdae venues. 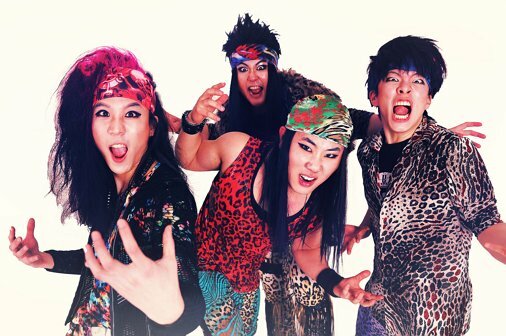 In 2010 the band won Rookie of the Year at the Olleh Music Indie Awards. Heo: This “post-rock” trio offers laid-back, dream-like melodies that still pack plenty of punch and grunt. YB: One of Korea’s most famous rock bands, YB was frequently called the representative Korean band for their hit “Go Korea” during the Korea/Japan FIFA World Cup in 2002. [su:m]: This twosome is one of the pioneers of revitalizing the rich sounds of traditional Korean music and reinterpreting them for modern listeners. No Brain: No Brain is considered the godfathers of the punk scene in Korea. Formed in Hongdae, the four bad boys have been rocking since the mid-’90s. Big Phony: Self-professed “writer of sad songs” Big Phony was born and raised in New York but relocated to Seoul to find his roots. His “fragile but controlled” voice stands in stark contrast to his heavy lyrics. The Solutions: The rock duo say that they draw on every decade since the ’50s to inspire their music. It shines through in their easy-to-love, diverse sound that can change with every song, but never disappoints.